The “Invisible Man” has been robbing banks all over town. He is so named because he leaves no trace, though the cops know he appears as a large, brutish man. Batman confronts the Invisible Man during a heist, and Batman is easily taken down. After hearing a report over the police band, TV reporter Summer Gleeson attempts to follow the Invisible Man after the heist. Instead, she runs into some thugs in an alley. A mysterious, handsome young man appears out of nowhere and takes down the thugs. She is smitten, but he quickly disappears. Batman attempts to ID the thief via the underworld, but no one has ever seen him. Batman encounters the Invisible man again at another bank, and plants a tracker. Meanwhile, the handsome man contacts Summer and arranges a date. The man is then waiting at a restaurant, when Batman appears and ensnares the man in a Bat-rope. As Batman suspected, the man reveals himself to be Clayface. A fight ensues, and Batman takes down Clayface with sonics. Summer arrives, shocked at the sight of Clayface. She asks Batman if a handsome man has been there. Batman says no one like that was ever here. This issue is a perfect example of the charm this series could deliver. The story is relatively simply, but still engaging. Summer is giving a more prominent role. Batman uses his detective skills. And Clayface is shown to have some depth beyond just an angry villain. Puckett scored high on this one. I don’t think Parobeck could draw a bad panel. We might as well get used to me gushing his praises, because I don’t think he can do wrong. He manages to capture the characters’ likeness while still retaining his own style, and infusing it all with energy. In retrospect of the entire series, this is tough to fit in. When this was printed, we’d only seen “Feat of Clay,” and not the subsequent episodes. Story wise, this probably would fit in somewhere after TNBA, but before JL. 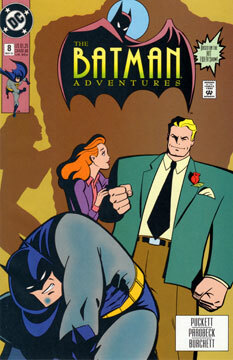 Given that the art style is clearly BTAS, that might bother some readers. But I’m okay with it. The Invisible Man might be a fun custom, though he’s just a big, round thug. And someday I’ll make a Summer Gleeson figure, and here we see her in a couple of alternative outfits. Well, it’ll be awhile. But I’ll get to her eventually.